"Used Hawks Flock to Giuliani's Team" runs the title of a Oct. 15 Newsweek smear of presidential candidate Rudy Giuliani, suggesting that the mayor's advisors, "some of the Bush era's most assertive neoconservatives," represent George W. Bush retreads. The article even quotes a foreign policy analyst accusing Giuliani of "out-Bushing Bush." Ever in lock-step, Time magazine's blog likewise asserted last week that Giuliani's "message seems to be that Bush's policies for the region have worked pretty well, so let's have more of the same." How odd. Actually, the opposite should be apparent about Newsweek's six featured advisors – Norman Podhoretz, Martin Kramer, Peter Berkowitz, Nile Gardiner, Robert Kasten, and myself. First, we collectively had many disagreements with Bush administration policies and, second, we lacked impact on them. In other words, the real story is Giuliani's fresh start in foreign policy, joined by a cast unconnected to the current president's successes and failures. Consider my own divergence from Bush administration policy. My writings and spoken statements over the past seven years have criticized the handling of Iraq, the war on terror, democratization, and (especially) the Arab-Israeli conflict. Iraq: Iraq policy is too ambitious, I time and again asserted, starting in April 2003. Under the slogan "Stay the course – but change the course," I developed a third position between the administration and its critics, one that called for getting foreigners quickly out of the business of running Iraq and coalition troops out of the cities and into the Iraqi countryside and borders. I ridiculed the massive U.S. embassy in Baghdad. I urged that elections be delayed and that authority be turned over to a democratically-minded Iraqi strongman. War on terror: I inveighed against the euphemistic and inaccurate term, "war on terror," arguing for the need to (1) identify the enemy correctly and (2) develop a clear set of goals to defeat it. I praised the improvements that culminated in Bush's statement of August 2006 that Americans are "at war with Islamic fascists," but then I rued his more recent retreat from naming the enemy. Democratization: When the president first announced the goal of increasing political participation in the Middle East, I applauded, even as I warned against the overly-abrupt replacement of tyranny with democracy, urging that the process be done slowly and cautiously. Noting that the actual implementation empowered Islamists, I assigned it a failing grade. Arab-Israeli conflict: I have objected to nearly every aspect of the current administration's policy in this theater, condemning Bush's landmark June 2002 speech for rewarding terrorism, rejecting his embrace of a Palestinian state, and warning after his reelection in 2004 of "potentially the most severe crisis ever in U.S.-Israel relations." I have predicted the forthcoming Annapolis round of negotiations will fail and worry about the damage they will inflict. Despite these differences, I twice voted enthusiastically for George W. Bush, am proud to have been his nominee in 2003, and predict historians will rate his presidency a success. 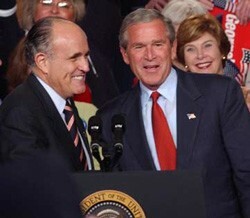 But presenting Rudy Giuliani and his advisors as Bush administration clones is nonsense. News magazines might consider doing some research before spouting off. In foreign policy, a patriotic, anti world-government approach that comes to the aid of fellow democratic states. I somewhat fit this triad, agreeing with the first and third prongs but not the second, where I lean libertarian. This ambiguity led me in 2005 to observe that I could never quite figure out whether or not I am a neoconservative – while noting that others long ago had apparently decided the matter for me. "Journalists use ‘neoconservative' to describe me, editors include my writings in a neoconservative anthology, critics plumb my views for insight into neoconservative thinking, and event hosts invite me to represent the neoconservative viewpoint." That said, if the term currently requires having supported George W. Bush's Middle East-related policies, then I am not a neoconservative. Related Topics: Conservatives & Liberals, US policy, US politics | Daniel Pipes receive the latest by email: subscribe to the free mef mailing list This text may be reposted or forwarded so long as it is presented as an integral whole with complete and accurate information provided about its author, date, place of publication, and original URL.